One of the interesting things that happened in last weekend's game between the Red Sox and the Giants was the performance of Yomiuri pitcher Tetsuya Utsumi. 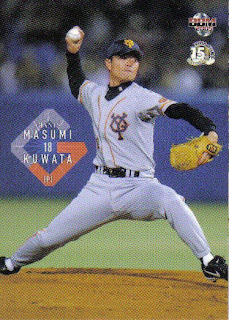 Utsumi came into the game in the third inning and struck out Kevin Youkilis, David Ortiz, Manny Ramirez, Mike Lowell, and JD Drew. In order. As in consecutively. Shades of Sawamura! Deanna Rubin went to the game and blogged about it here and here and put her pictures on line here. Sports Illustrated has put their entire run of magazines on line for free. Every issue since 1954 is available. Of possible interest to Japanese baseball fans, there have been two issues that have featured Japanese baseball on the cover. 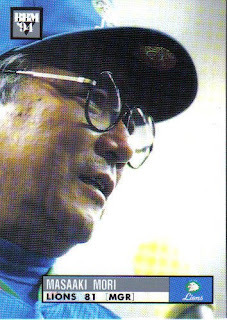 Sadaharu Oh graced the cover of an issue from 1977, which featured an article on him by no less than Frank Deford. 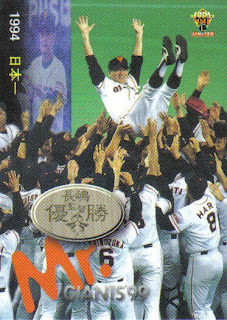 The other issue came out during the 1994 player's strike and contained an article on the ongoing Nippon Series between the Lions and the Giants. 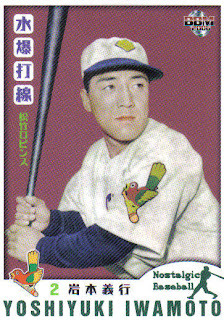 Lions pitcher Hisanobu Watanabe was on the cover. The article on the Series was very interesting. 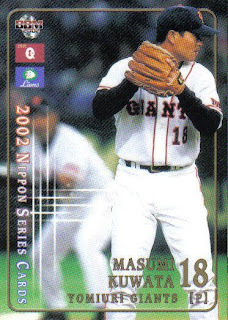 I knew that Lions manager Masaaki Mori had been a catcher for the Giants during the V9 years (under the name Masahiko Mori), but I hadn't realized that he had retired at the same time as Shigeo Nagashima. 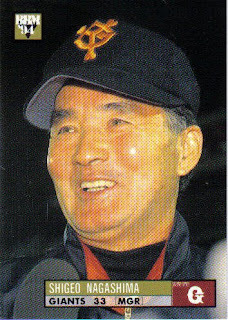 If the article is to be believed (always a question when the American press talks about Japanese baseball), Mori asked for a position on Nagashima's coaching staff for the Giants (Nagashima retired as a player and immediately became the Giants manager at the end of the 1974 season). Nagashima refused and apparently Mori has been resentful ever since. 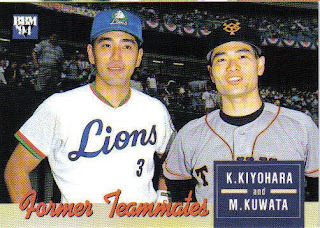 So when the two faced off against each other in the 1994 Nippon Series (Nagashima was the Giants manager), it wasn't just a baseball series - it was personal (cue dramatic music). Whatever. 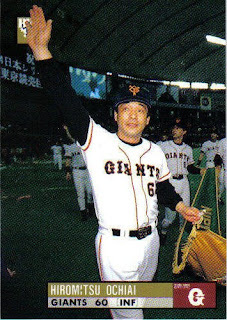 The Giants took the Series in 6 games for Nagashima's first (of two) championship. 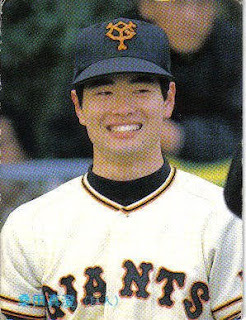 Mori would eventually win six championships, so it looks like it all worked out for him in the end. 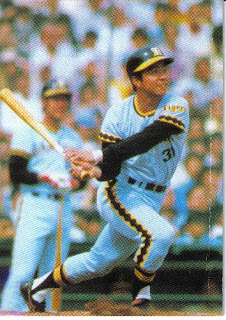 One other note - this would be the only Nippon Series championship for Hiromitsu Ochiai as a player. 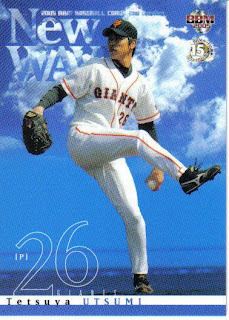 From top to bottom, that's his 1987 Calbee card (# 150), a 1994 BBM card of him with his former PL Gakuen (high school) and future Giants teammate Kazuhiro Kiyohara (# 547), his 2002 BBM Nippon Series card (with Kiyohara in the background) (# S4) and his 2005 BBM Giants card (# G007). Even if it wasn't him, it gives me an excuse to show the card. Can anyone confirm if it was him and also tell me who threw out the first pitch before the Red Sox/Tigers game (who was also shown in a video clip but not identified)? 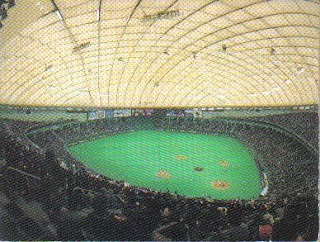 Tuesday marks the twentieth anniversary of first game ever at the Tokyo Dome, the first domed stadium in Japan. Built on the site of Korakuen Stadium, it has been home to the Giants since it opened and was the home of the Fighters until they moved to Sapporo after the 2003 season. It's been the site of a couple major league baseball games (Mets & Cubs in 2000, Yankees & Devil Rays in 2004 and the upcoming Red Sox & A's series), the Asia Cup series every year since 2005, and one of the first rounds of the World Baseball Classic in 2006. Wikipedia has an article on the dome here. 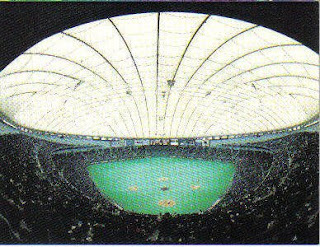 There are now five other domes in Japan, meaning that half of the twelve teams play indoors (although a couple domes have retractable roofs). Tuesday marks two milestones in former Hawk, Robin and Flyer Yoshiyuki Iwamoto's life. It will be the 58th anniversary of his hitting the first home run in Central League history and it will be his 96th birthday. 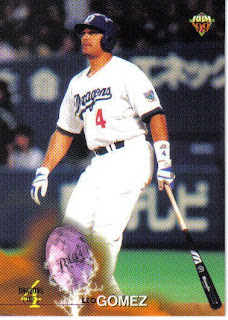 Former Chunichi Dragon and Baltimore Oriole Leo Gomez turns 41 today.